A medium is a substance that can be added to paint to change the way the colour appears and/or behaves. You can also use a medium to alter sheen, texture, transparency or drying time. Read on for our rundown of the most popular acrylic painting mediums. Gloss mediums are used to enhance the luminosity and natural sheen of acrylics. They typically make paint thinner and more transparent. Great for glazes. Use a matte medium for a subtle, non-reflective finish. 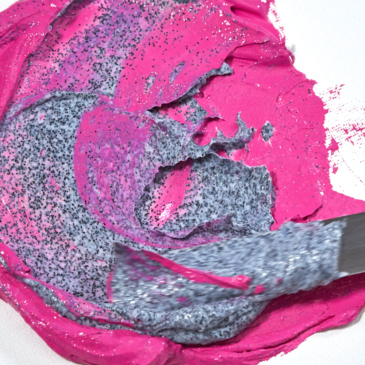 Mix Gloss and Matte mediums together to create your own ‘semi-gloss’. Like Gel Medium but thicker and harder. Modelling paste makes your painting three dimensional by building up a relief that can be manipulated once dry. A white, paste-like gel that thickens your paint – great for impasto techniques. Makes paint suitable for collage work. Slows down drying time of acrylic so it behaves more like oil paint. Retarding mediums also allow you to create smooth blending effects. Thins acrylics for use with wash techniques & painting over large areas. Doesn’t compromise colour strength. Save up to 50% on our extensive range of Acrylic Mediums in-store & online now! Our Mediums Event ends 29/04/18.